Recovered: 26 years after its theft "San Carlo Borromeo in Contemplation"
In a ceremony held at the San Pietro Apostolo in Cavenago d'Adda, Italy, parishioners celebrate the return of the 17th century painting "San Carlo Borromeo in Contemplation" by early Baroque artist Daniele Crespi. Stolen twenty-six years ago, on February 5, 1992, together with two other portraits, one of San Francesco d'Assisi and another of Sant'Anna, one of the three paintings has been recovered by officers from the Venice division of Italy's Comando Carabinieri Tutela Patrimonio Culturale, under the supervision of Major Christian Costantini, commander. This is not the first artwork by Daniele Crespi to have been stolen and recovered by the Carabinieri. 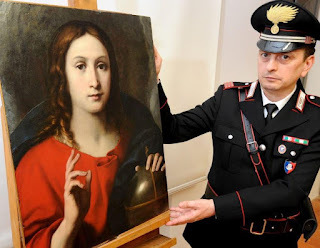 The painting "Il Christo, Salvator Mundi" was stolen in between the 16th and the 17th of January 1989 from the private residence of an art collector in Castiglione Olona. Recognised by the Carabinieri TPC in November 2011, the squad identified the stolen artwork from auction records at Sotheby's dating to 2004 in London. After confirming with the painting's heirs that the artwork matched their stolen object and without valid export documentation.